Horseback riding, attending motorcycle races, enjoying outdoor activities and walking her dogs. 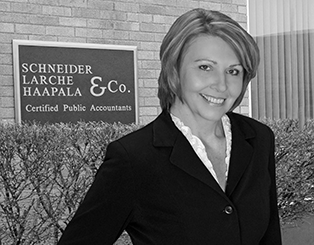 Ms. Meiers is a partner with Schneider, Larche, Haapala and Company and practices in the audit, accounting and tax areas. In her thirty years of experience she has audited financial institutions, governmental and nonprofit entities, employee benefit plans and commercial enterprises. Ms Meiers' current practice areas focus on banking, logging, trucking and manufacturing clients and she also practices in the corporate, individual, and trust and estate tax areas. As quality control partner of the firm, Ms. Meiers is responsible for leading and overseeing the firm's audit and accounting practice quality control initiative. She is also a member of the firm's continuing education committee.